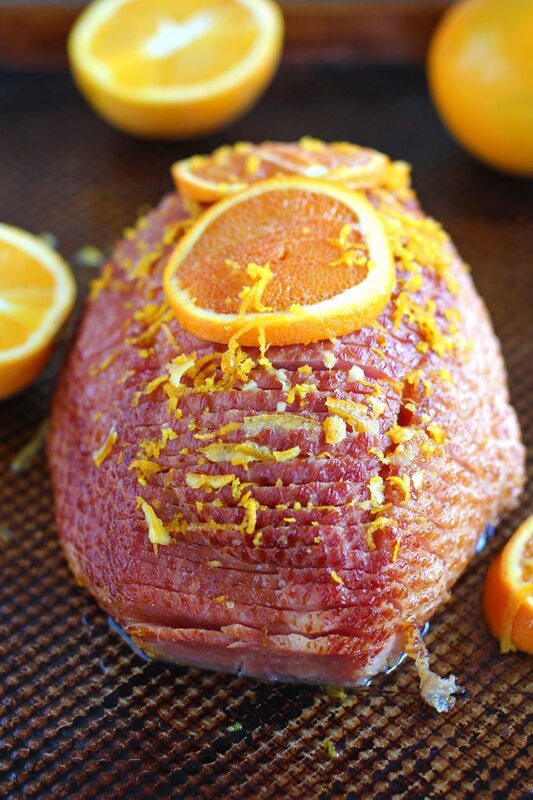 Slow Cooker Brown Sugar Ham with Orange Glaze is an amazingly flavorful and refreshing way to easily cook ham to juicy perfection in your slow cooker. Our love for Slow Cooker meals has been well documented here. We like making easy and restaurant quality dishes using it. Among our most popular recipes are Crockpot Asian Short Ribs, Sesame Chicken and Tuscan Chicken Pasta. 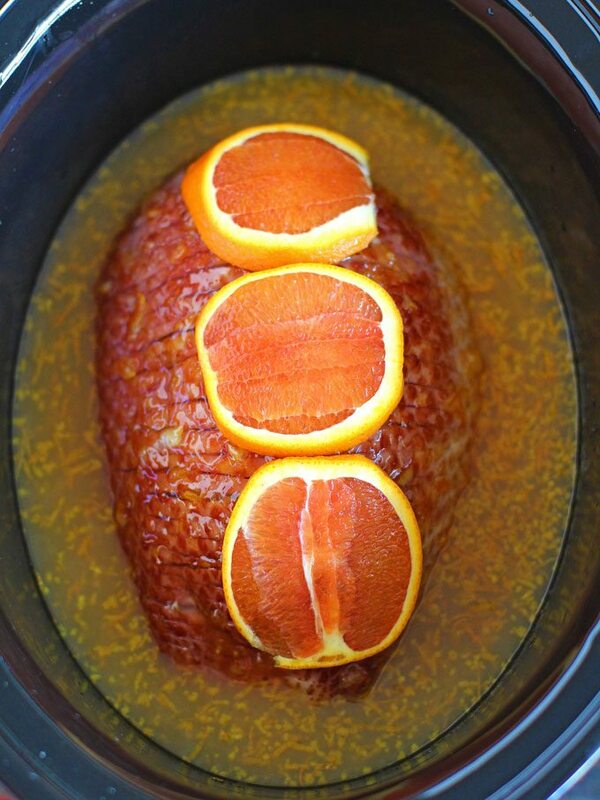 Slow Cooker Brown Sugar Ham with Orange Glaze is so incredibly flavorful and delicious. 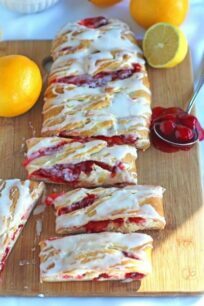 It is perfect to make for a springtime get together as the sweet and fresh flavors truly shine. The best part is that the crockpot does all the work, and you will end up with the BEST holiday ham! I like to serve it with mashed potatoes, biscuits and a warm green bean salad. 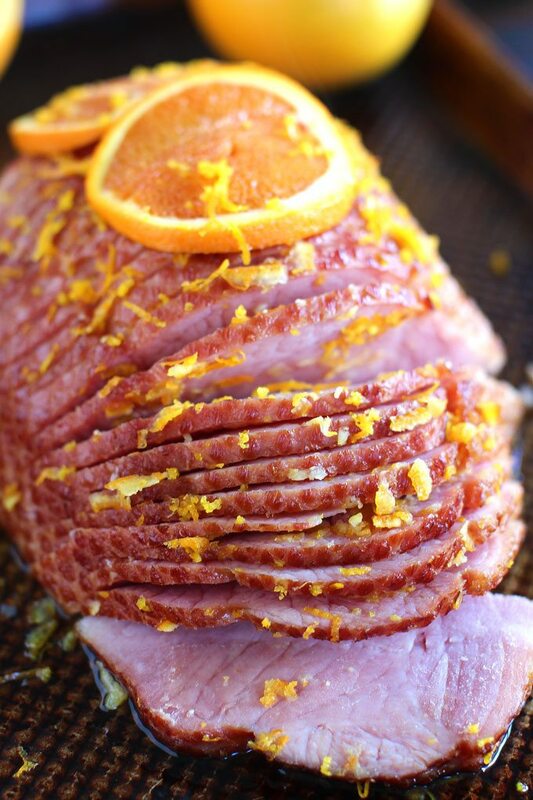 This Slow Cooker Brown Sugar Ham with Orange Glaze is so easy to make, which gives you more time to do more fun things than spending extra time in the kitchen. With sweet brown sugar notes and a beautiful citrus finish. This ham will be a hit with everyone, either you choose to serve it for brunch or dinner! Why you will enjoy Slow Cooker Brown Sugar Ham? Very easy to make so you can spend more time entertaining not cooking. Delicious flavor and texture, the brown sugar and orange combo is fantastic. Set your meat in the crockpot, and forget it about it until it’s time to serve it. Perfect springtime or Easter main dish, it will be a crowd pleaser. HOW DO YOU MAKE Crockpot Brown Sugar POT HAM? This is one of the easiest dishes to make in the slow cooker. The first step is to choose your ham. I like to use a smoked spiral cut. Also, you’ll want a ham around 7-8 pounds in size. If you go any larger, you may have trouble fitting it into your crockpot. Therefore, ensure to get a piece that will be able to fit. Also, you can always trim off the end to make it fit if needed. Once you have the meat, the rest is simple. Just put in the pot, coat it with brown sugar and orange mixture to form a sweet glaze that simmers away along with the meat. Then, let it cook to perfection! HOW MUCH HAM do I need PER PERSON? You’ll need about 3/4 pound of ham per person for a bone-in ham. However, if you are planning on hosting a larger crowd, increase that amount to 1 pound of meat per person. This way, you will also end up with plenty of leftovers. Grate the skin of the orange only. Grate just enough to get through the orange skin, this way you can avoid the bitter white pith underneath. WHAT TO SERVE WITH Slow Cooker Brown Sugar Ham? Can I store Slow Cooker Brown Sugar Ham? It’s best to store a baked ham for up to 3-4 days in the refrigerator. However, if you have a pre-cooked ham that is not yet opened, it can stay in the fridge for up to 2 weeks. HOW TO REHEAT LEFTOVER HAM? A great thing about a big junk of ham is that you usually end up with delicious leftovers. To reheat the leftover ham, simply reheat it by covering it with foil and warming it in a 350 degree F oven for about 20 minutes. You’ll need a large oval slow cooker for this recipe. We like this 8 quarts model. Choose the best ham. I like boneless Smoked Ham, which is gluten and milk free, plus it has the exceptional flavor of a traditional bone-in ham without the bone, which makes slicing so much easier. Also, use fresh orange zest, as will add a refreshing citrusy flavor, which screams spring to me. Not a fan of orange juice? Try apple cider instead. It is equally delicious! In addition, using fresh orange juice and orange slices will add another flavor palette and will balance the savory part of the dish. Using the orange marmalade is optional, but I find that it works nicely with the brown sugar in this recipe. 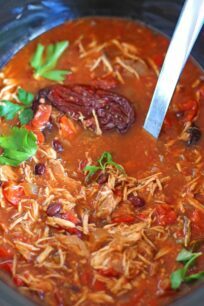 Slow Cooker – makes life o much easier, set it, forget it and serve it when ready! Boar’s Head Sweet Slice® Ham – I used the half ham for this recipe, and it was perfect for our family get together. 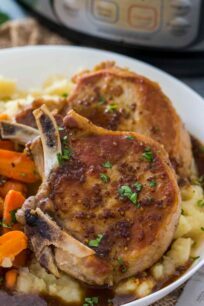 Boar’s Head Brown Sugar & Spice Glaze – adds extra brown sugar flavor to this dish. Orange Marmalade – adds extra orange flavor to the meat. In a medium bowl combine: 2 cups brown sugar, 2 cups orange juice, 3 tablespoons orange zest and 8 ounces of orange marmalade, whisk to combine. If the ham is not pre-sliced, slice it, one inch from the bottom/flat side, so the slices are still holding together. Place ham flat side down in the slow cooker. Pour the brown sugar orange mixture over it. Spread the remaining orange marmalade and Boar’s Head Brown Sugar & Spice Glaze in between the slices. Top the ham with the remaining ½ cup of brown sugar, rub it well into the ham. Top with orange slices. Put the lid on slow cooker and cook on low for 4 hours, or high for 2 hours. Since the ham is pre-cooked, you're are only heating it up and melding the flavors into it. Cooking too long will just dry it out. During the cooking process, lift the lid a few times and using a ladle pour the juices over the meat in order to keep it moist. Once ready, slice ham and serve. Store it in an airtight container filled with the brown sugar orange glaze mixture from the crockpot. I can’t resist that orange glaze, I bet it gives the ham so much flavor! Perfect for me! I’m in love with my slow cooker making my dinner process easier! I’ll be adding this to our menu next week. Thanks! I’ve seen those hams at the store and have always wanted to try them. Now I have to! This looks incredible! Thanks for the wonderful recipe. You had me at orange glaze! I can’t wait to serve this at Easter! Love all that orange up on top! 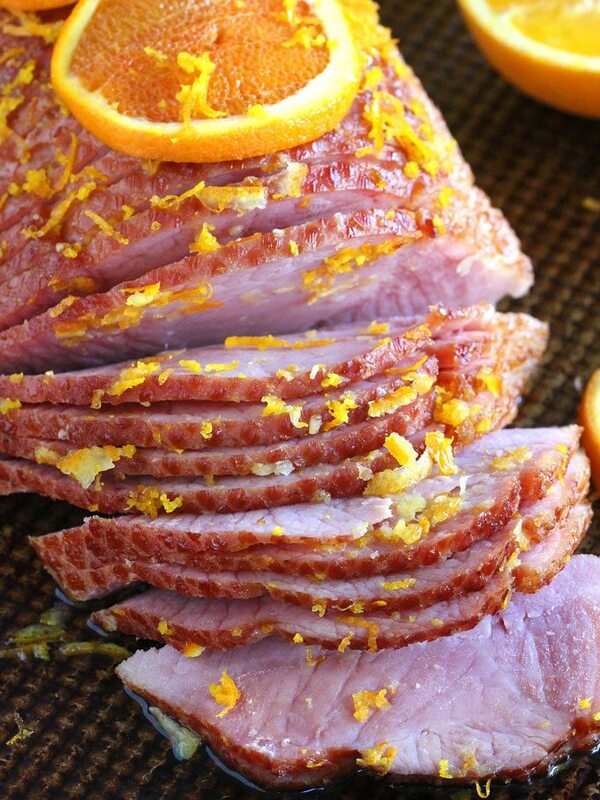 I love making ham in the slow cooker, and the orange glaze looks amazing! I love that you can put this in a slow cooker and forget about it for a few hours. Dumb question but if I wanna use the whole ham do I double the ingredients? Or can I not use the whole ham? Hi Thalia, not dumb at all, I would double everything except the brown sugar, use 4 cups of brown sugar. Let me now if you any there questions. What is in the Sugar and Spice Glaze? I can’t find that brand of ham so I have one that doesn’t have a packet. Its just a blend of brown sugar and some spices, you can skip it, and only use the marmalade and the brown sugar called in the recipe. I can not find the Boar’s Head ham any where. Is there a suitable ham replacement? You can use any boneless, sliced ham. Looks delicious, have to try!